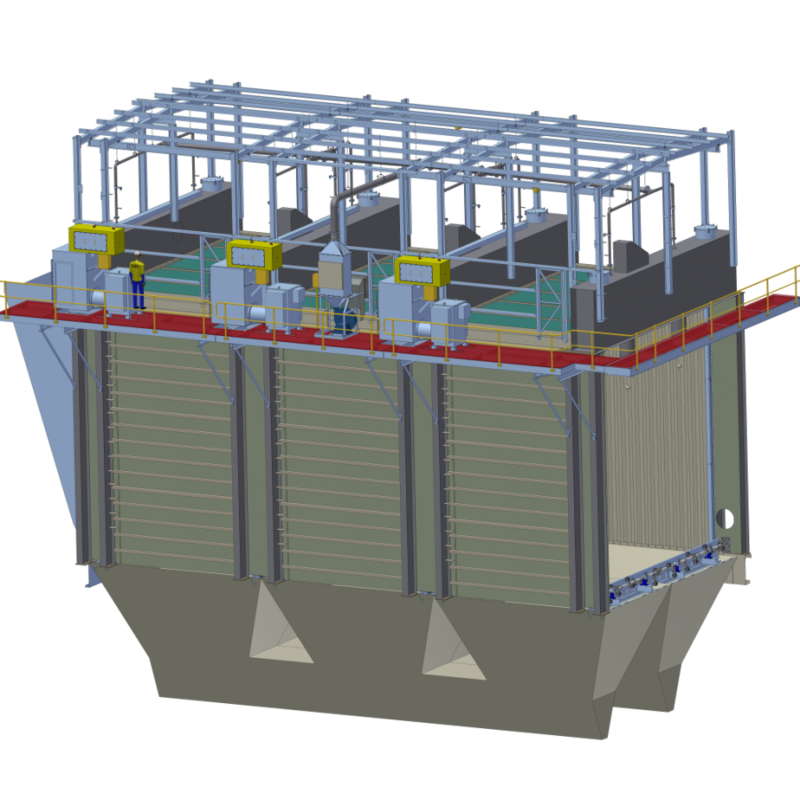 An electrostatic precipitator (abbreviated to “ESP” or “EP” or “precip”), is a particulate collection device that removes particles from a gas stream using the force of an induced electrostatic charge. Electrostatic precipitators are highly efficient filtration devices that operate at a very low pressure drop, and can easily remove fine particulate matter such as dust and smoke from the air stream. In contrast to wet scrubbers and fabric filters, which apply energy directly to the flowing fluid medium, an ESP applies energy only to the particulate matter being collected and therefore is very efficient in its consumption of energy (in the form of electricity). 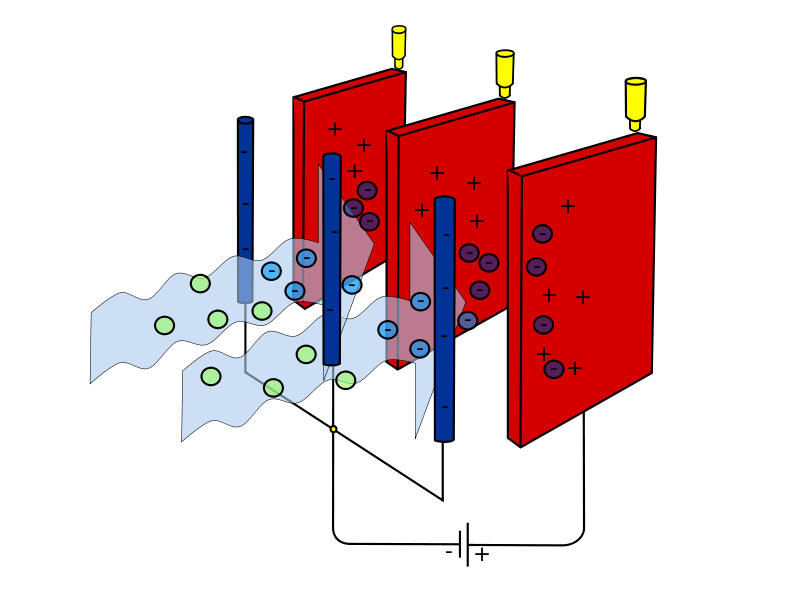 A very high voltage (typically 40,000 to 110,000 Volts) is developed across an air gap between a discharge electrode (in blue opposite) and a flat metal collecting surface or plate (in red). The process gases (laden with dust) pass between these collecting surfaces and in so doing passes through the highly energised electric field. The dust particles are then charged negatively by cascading electrons and gas molecules. The strong electrical field then drives the dust to the collecting plates where it’s deposited. 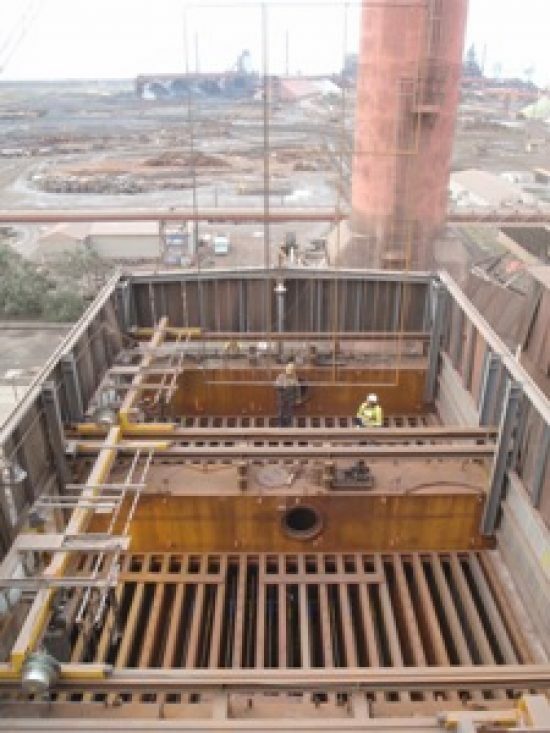 Dry electrostatic precipitators have long been the industry standard in applications such as coal fired power stations, paper mills, cement plants and mineral refineries. They have the advantages of a very low pressure drop, high removal efficiency of fine particulate and the ability to operate at temperatures up to 400°C. Wet electrostatic precepitators (or WESPs) can be used downstream for saturated flue gas to remove particulate material. Dust separation by means of electrical charging between the discharge electrodes and the earthed collecting electrodes, designed in tubes, honeycomb tubes and plates. The particle collection efficiency is more than 99.97 % and the gas velocity of 0.5 to 3.0 m/s. 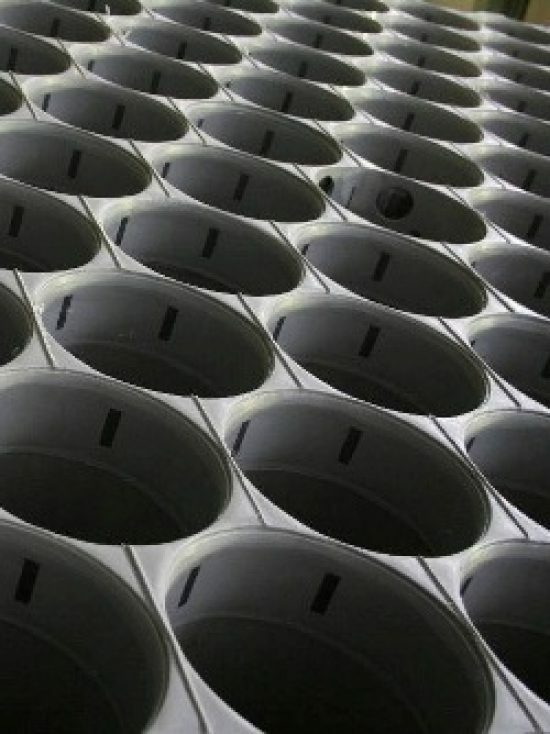 Unbreakable discharge electrodes used for high availability. Software directed high tension control system provides a maximum collection efficiency at the most possible low power consumption. Acid Mist electrostatic precipitators (or MESPs) are one of the original styles of ESP developed over 100 years ago by Dr Frederick Cottrell to collect sulfuric acid fumes. The design has evolved significantly since then. Traditionally these units were built from lead to withstand the sulfuric acid mist, whereas today they are made from advanced plastics with carbon and platinum earthing. These units are typically found in sufuric acid plants to separate out fine particulate and sulfuric acid mist from the SO2-rich gas stream, hence protecting the SO2/SO3 converter catalyst downstream. They have the advantages of a very low pressure drop whilst maintaining high removal efficiencies of mists and fine particulate.